Haleigh McGraw stands at the top of the podium after winning the OHWAY 8U 59lb+ State Championship. She won both of her matches by pin. Haleigh is a second-grader at Miami Trace. Lyndyn Gibbs stands at the top of the podium. Lyndyn is a sixth-grader at Washington Middle School. She is a five-time State placer and in her last year with the Cobras won a State championship. On her path, Lyndyn beat two former State champions, one by tech fall and one by Pin. She is the OHWAY 12u 87+ Light Champion. Jake Bashor, a sixth-grader at Washington Middle School, stands in the second place spot on the podium (third from left). Jake is a four-time State placer and runner up this year. Jake had a pin and tech fall in his path to the finals. The Court House Cobras sent 27 kids to the Oh-way state championship. On Saturday, March 16, the 9, 10, 11 and 12-year-old boys and all girls competed for their spot on the podium. The Cobras placed third as a team, only behind two all-star teams that recruit from all over Ohio. There were 13 place-winners with one runner up and two State champions. 3rd: Casen Snyder; 4th: Jackson Keaton, Spencer Smith; 5th: Malachi McCullough, Brendon Peters; 6th: Wesley Gibbs, Joshua McGraw, Alex Utrera; 7th: Will Enochs; 8th: Rylan Tennison and Colt Burchett. There were three Cobras advancing to the State finals matches. Jake Bashor pinned his way through the quarters and semifinal matches. He lost by decision in the finals. Haleigh McGraw pinned her way to secure her spot on the top of the podium. Lyndyn Gibbs pinned a former state champ and rival in her finals match. 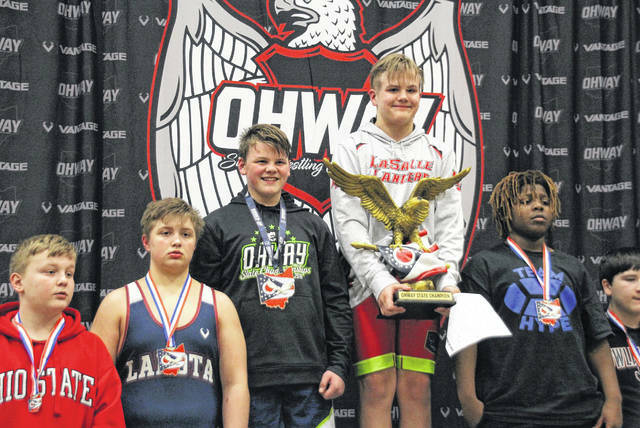 https://www.recordherald.com/wp-content/uploads/sites/27/2019/03/web1_Haliegh-McGraw.jpgHaleigh McGraw stands at the top of the podium after winning the OHWAY 8U 59lb+ State Championship. She won both of her matches by pin. Haleigh is a second-grader at Miami Trace.